My family and I have been on a slime making frenzy over the last few weeks. In fact, we’ve made so much slime that my kids actually talked me into opening our very own Etsy store that sells slime. We make so much slime that it only makes sense. Plus its a fun way for our family to be able to share some of our fun creations. 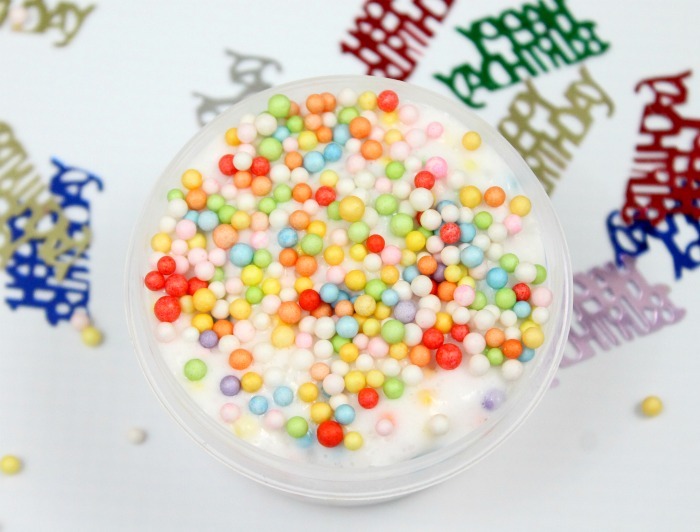 This past week we made a Birthday cake Confetti slime recipe using a white fluffy slime and lot’s of colorful styrofoam balls. 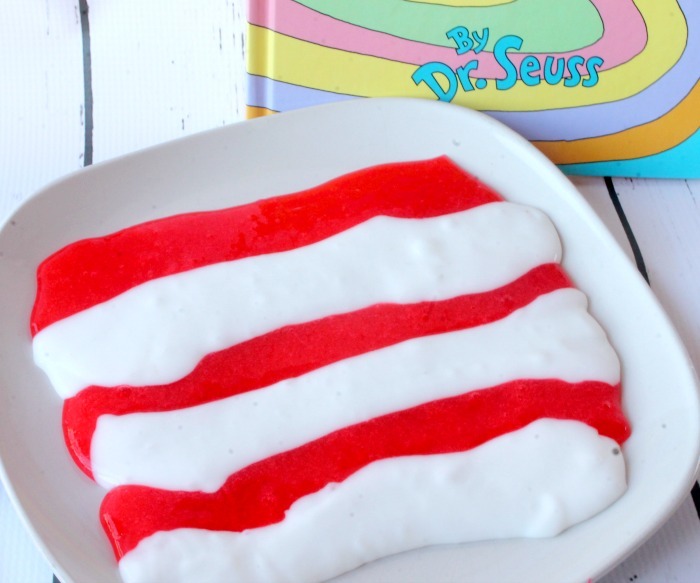 It actually turned out to be one of my FAVORITE slime recipes. Birthday Cake Slime Is Not For Eating! PLEASE NOTE: I know how visually appealing this Birthday cake slime is. And even though it may look like it tastes good it is not meant to be eaten, tasted, or put anywhere near your mouth. Make sure that you are only playing these kinds of sensory play activities with children who can tell the difference between food and slime. If you do play with smaller kids make sure there is always an adult present to help. To make this super fun festive slime you are going to need to make fluffy slime. You don’t want to add any colors into this slime. Leaving the fluffy slime white will really help those colorful styrofoam balls stand out when they are mixed into the fluffy slime. So without the coloring you are going to need white glue, shaving cream, lotion, foaming hand wash, cornstarch and borax slime activator. Fluffy slime is a much squishier, poofier slime than normal slime. It’s easier to manipulate and shape. 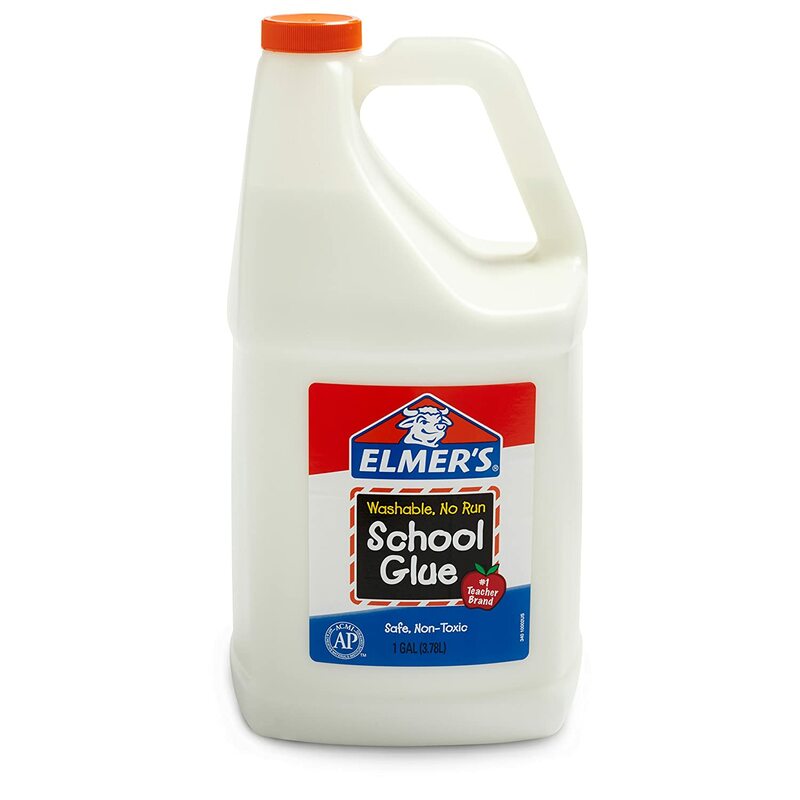 White School Glue: I always buy and use GALLON SIZED GLUE. It’s much more cost effective than the smaller bottles and with the gallon size you know you will always have glue on hand. 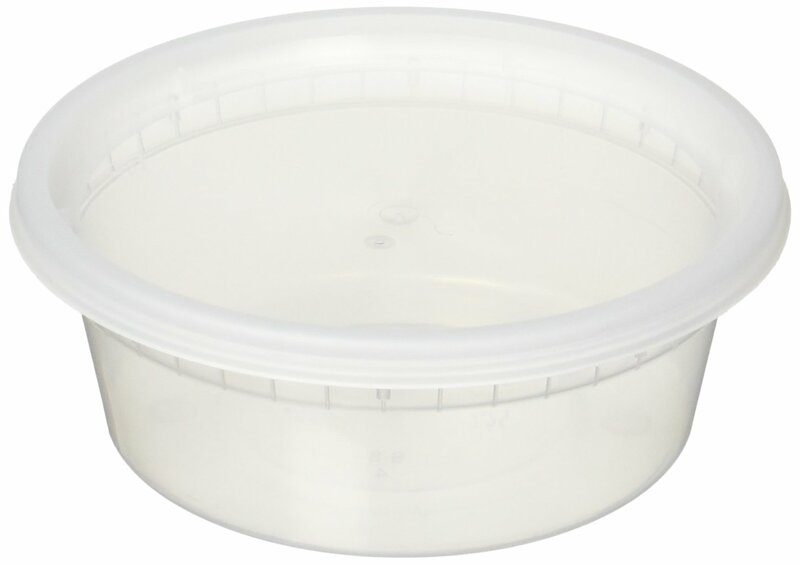 It’s also great to have a back up in case your first batch of slime doesn’t turn out quite right. 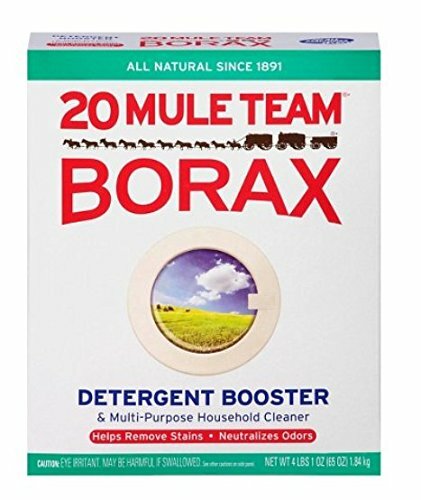 Borax: Borax can be hard to find in stores which is why I also pick up a box of it online. 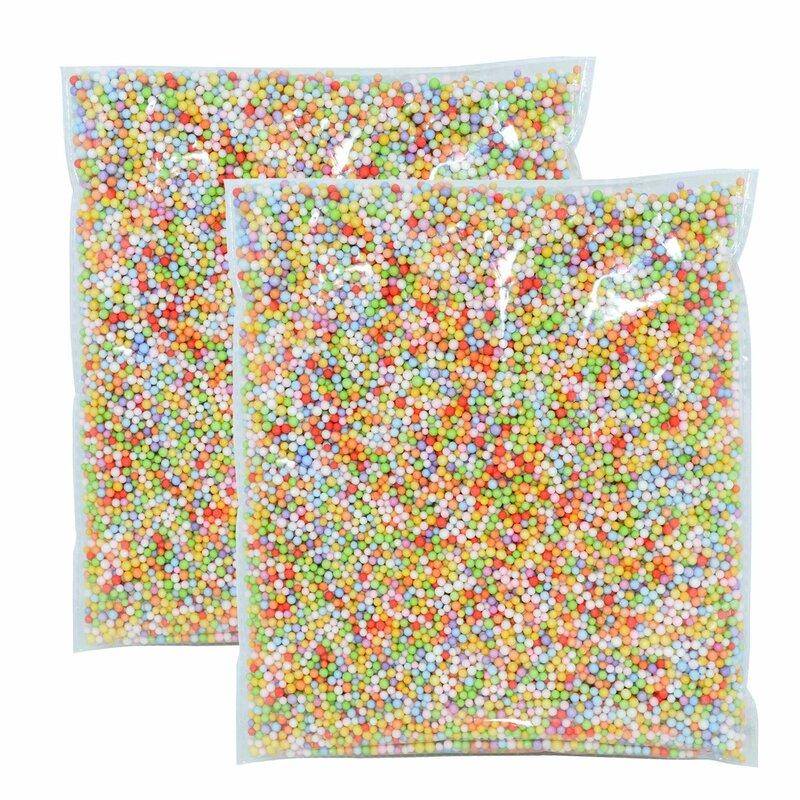 Colorful Styrofoam Balls: You will need LOTS of these colorful balls for your fluffy slime. 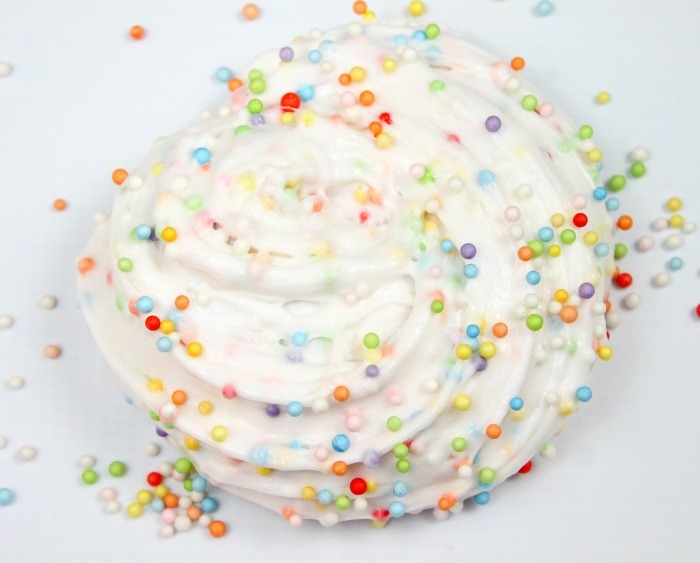 To make this Birthday cake confetti slime you are going to mix 1 cup of white glue with 1 cup of shaving cream. Mix that well and then add in 1 cup of foaming hand wash.
Now add in the 1 tsp cornstarch and about 1 tsp body lotion. The lotion and cornstarch are optional but I find that they help make the consistency of this fluffy slime super fluffy and stretchy. Now you are going to mix in your slime activator. I have a step by step recipe on how to make borax slime activator here. Add in about 1 tsp of slime activator to your mixture and stir. Keep adding in the borax until you can no longer stir. Next take the slime out of the bowl and knead it with your hands. If it’s still sticky just add a little more borax activator to it. 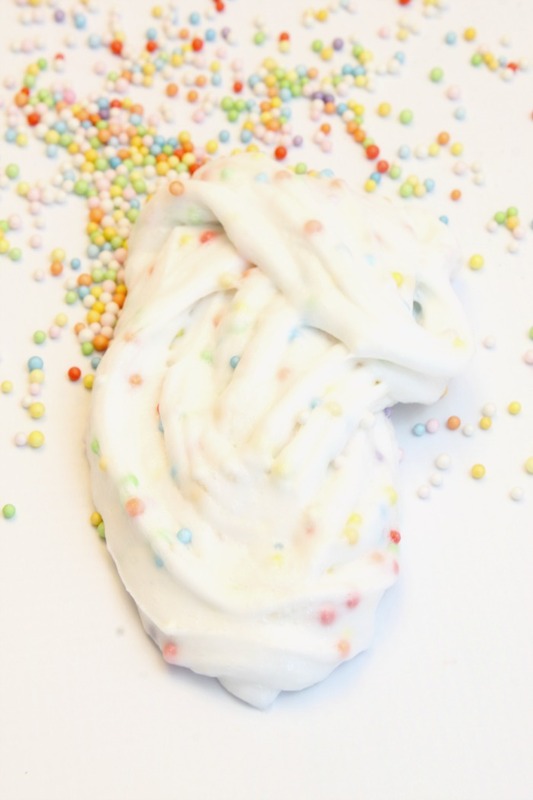 One of the things that I love most about this Confetti slime is that it’s great for making those soft serve slime swirls. All you do to make those is stretch it out several times and then twirl it around in a circle on the table. It will give it that ice cream swirl look. Slime is a great activity to do at a birthday party. We first did slime at my son’s 4th birthday party which was a science themed party. The kids LOVED it! My suggestion would be to make a large batch of the activator before hand and have all of the ingredients and utensils ready to go. Or if you would like to make the slime yourself and just hand them out that’s a great idea too! 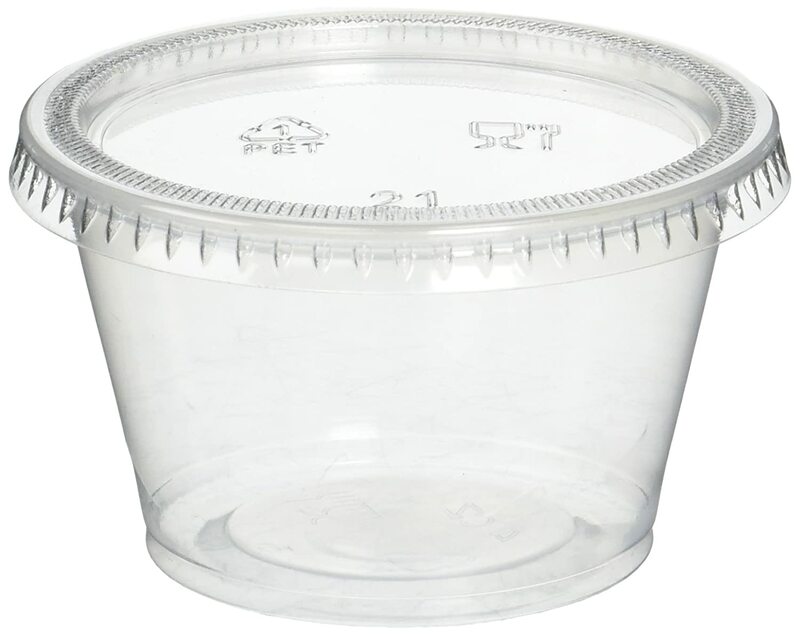 Here are some of the containers that are inexpensive and great for holding slime. 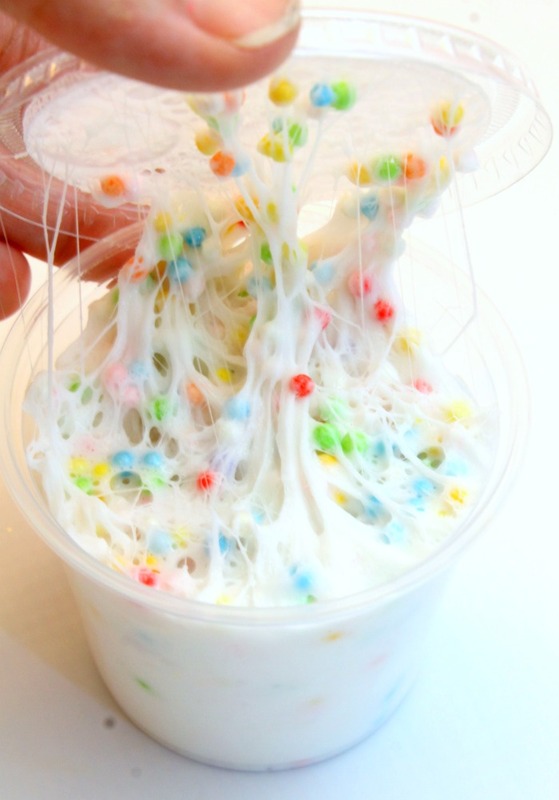 To show you exactly how I made this birthday cake confetti slime I posted a slime video to my Youtube channel. I have been doing a lot of slime videos lately so be sure to subscribe so you don’t miss one. 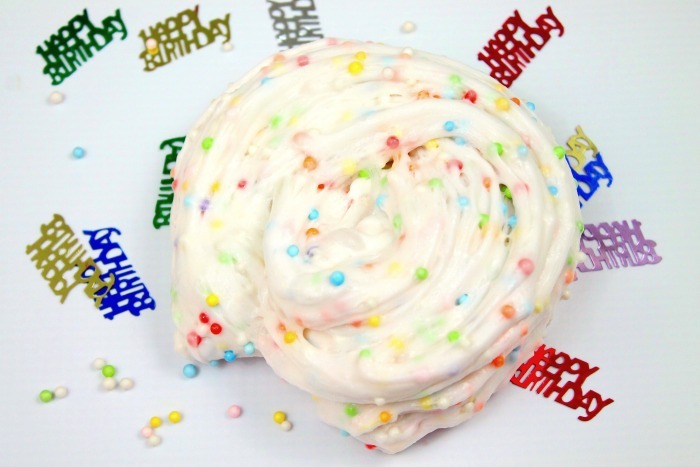 If you like this Birthday Cake Confetti Slime then be sure to check out some of my other slime recipes! 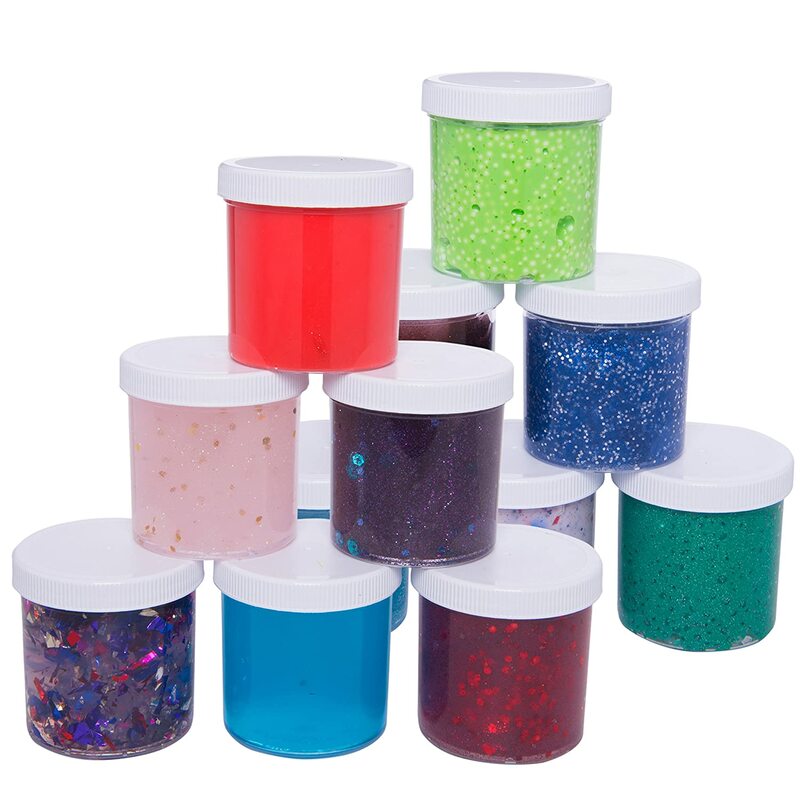 Thanks for Birthday Cake Confetti Slime~ many Parents are adverse to Borax (in organic) for binding the thickness a less non toxic solution is using Sta~Flo Liquid Starch (environmental friendly). Just a NOTE: mentioned from other parents: liquid starch is a suspension of starch, which is a organic polysaccharide, empirical formula (C₆H₁₀O₅)x. Borax is the inorganic sodium tetraborate, Na₂B₄O₇. The only thing they have in common is that they’re used as laundry products for completely different reasons.